22. William Merrill FISK was born on 16 May 1875 in Pleasant Hill, Cass, Missouri. He died on 7 Aug 1942 in St. Helens, Oregon. i. Frank FISK was born on 30 Sep 1897 in Oklahoma. He died in Feb 1981 in Oklahoma City, Oklahoma. ii. Neal or Neil FISK. iii. Lewis James FISK was born on 10 Feb 1903 in Oklahoma. He died on 29 Feb 1992.
iv. Sherban Perry FISK was born on 3 Oct 1905. He died in Nov 1974 in Walters, Oklahoma. 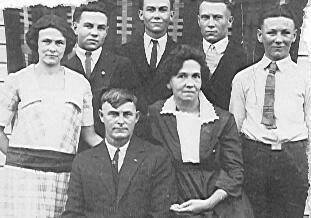 Sherban Perry FISK and Ila Fae HASKINS were married in 1927. Ila Fae HASKINS was born on 18 Jan 1909. She died in Jan 1989 in Walters, Oklahoma. Family of William Merrill Fisk and Bertha Howe.